Here’s a great new drink suggestion to try for the summer. I call it the Cherry Bomb. It’s the perfect choice if you need something cold and tasty on a hot day – and you also want a powerful health tonic dose in the process. This little glass packs more benefit than any I’ve seen or concocted to date. It’s anti-inflammatory, antioxidant and flavonoid composition blows away most other recipes, and I was also very surprised to find that the taste followed suit. If you are an anti-ager like myself, if you seek cardiovascular health or if you want a drink that can foster rapid muscle recovery after exercise you should give it a taste. 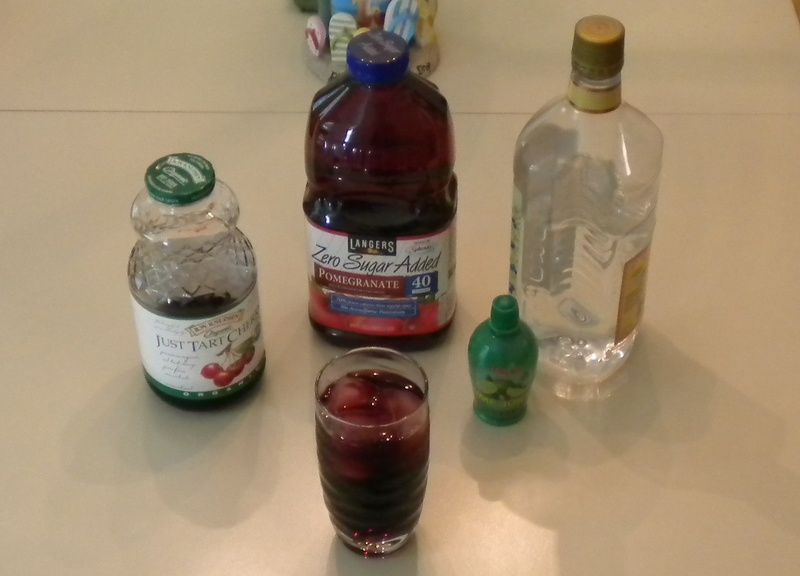 Mix 1/3 glass of tart cherry juice, 1/3 glass unsweetened pomegranate juice, and @1/4 glass selzer (lime flavored is great) a squirt of lime, one shot vodka (optional) and top with ice. Tart cherry has received a lot of attention lately because of its powerful inflammatory suppression properties. its antioxidant rating has tested higher than other popular food sources like dark chocolate and red wine. Note that tart cherry is superior to sweet cherries in this area. When tested for pain relief, the tart variety has shown to be as effective as ibuprofen and naproxen in some studies. In one sports related study, marathon runners were given either tart cherry juice or a control drink for 5 consecutive days before a race, on the day of the race, and for two days following it. The tart cherry group showed faster isometric strength improvement after the race, demonstrating an accelerated recovery over the placebo group. Other studies have supported tart cherry’s ability to reduce the pain and strength loss incurred with strenuous exercise. Pomegranate juice has shown cardiovascular benefits second to no other beverage. As discussed here in previous posts, this fruit has the remarkable ability to remove accumulated arthrosclerotic plaque from the arteries. (“studies” page above). This in effect reverses a classic marker of aging. The polyphenols in pomegranate activate the paraoxinase 1 enzyme, (Pon1) which both raises the concentration of beneficial HDL in the blood, and inhibits the oxidization of LDL – a prime culprit in cardiovascular disease. So if you wish to happily indulge in a great drink this summer – without any guilt, this might be the one to try. Even if you only have one of these over the course of the day, you’ve done your body right. I might recommend experimenting with the proportions that you mix, tart cherries can have a cloying taste not diluted in a certain way. The lime juice can lessen this. Done right this drink tastes a bit like a Cape-codder. I have thus decided to always keep some cherry and pomegranate juice in the “chilled medicine cabinet” from now on. It goes well with dinner also. This entry was posted in Diet, Exercise and tagged antioxidants, beverages, exercise pain relief, health, pomegranate, tart cherry. Bookmark the permalink.